NHS hearing services are being scaled back in England, an investigation by campaigners suggests. Data obtained by Action on Hearing Loss from 128 hospitals found more than 40% had seen cuts in the past 18 months. In particular, the study found evidence of rises in waiting times and reductions in follow-up care. The report is the latest in a growing number to have suggested front-line care is being rationed as the health service struggles with finances. The NHS is in the middle of a £20bn five-year savings drive. The government believes the savings can be made by increasing productivity. But in the past year reports have suggested everything from hip and knee operations to eye surgery is being cut. Using the Freedom of Information Act, Action on Hearing Loss asked all 135 hospitals with audiology units whether they were having to scale back services. In total 128 replied, with 43% reporting some kind of cut. The most common problems were rises in waiting times, reductions in follow-up appointments - considered vital to helping people adapt to their hearing aids - and a lack of specialist staff to deal with complex cases. But the report also found evidence of trusts starting to provide only one hearing aid when two had been judged to be clinically necessary. The seven health boards in Wales were also asked about cuts, but only two responded, with one saying waiting times were increasing. Action on Hearing Loss chief executive Paul Breckell said: "People with hearing loss have the right to expect the very best local services, so it's concerning that so many audiology departments have already felt the impact of budget cuts. "Making savings from hearing service cuts right now is a false economy because it will only lead to higher NHS and social care costs to support people with untreated loss in the long run." 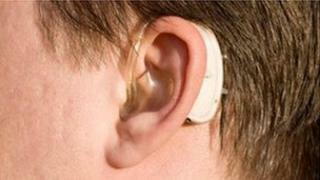 Health Minister Lord Howe said: "It is important that patients get high quality audiology services. "We are working with stakeholders, including Action on Hearing Loss, to set out what needs to be done in the future to improve results for hearing loss in adults and children." He also pointed out that the latest figures showed more than 98% of patients were being treated within 18 weeks - the official target for waiting.